As he spray painted the baleen of a baby whale on the side of the AES power plant in Redondo Beach from a cherry picker 95-feet in the air, Wyland imagined himself on the ground. The artist, who goes only by his family name, does not outline his murals, nor even prepare sketches for reference. “I pretend like I’m painting the whales as they swim by. I’ve studied whales since I was a child, so it’s all in my mind. I’ve had billboard painters watch me and say they can’t believe I can paint this way,” he said. Wyland completed the 586-foot long, 95-foot high Redondo mural, using 3,000 gallons of paint, in just 11 days in June 1991. On Tuesday, he added the 20-foot whale to the mural in about two hours. “When you paint for free, you have to work fast,” he joked. 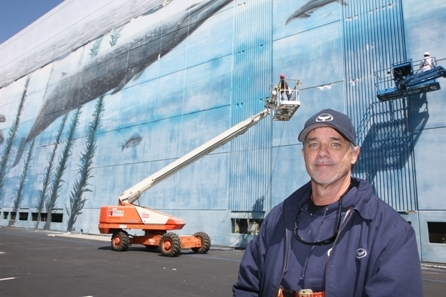 Over the next few days, Wyland’s crew will restore the rest of the mural, which, he noted, is in remarkably good condition after 20 years of exposure to the elements. “I’m not doing a Joan Rivers facelift, just a little Botox here and there,” he said. The restoration comes at the instigation of local documentary film maker Tom Kearney, who convinced AES that the mural’s 20th anniversary should be recognized. AES agreed and is donating equipment and materials needed for the restoration. An estimated 1,000 gallons of paint are being donated by Dunn Edwards Paint. The documentary made when the mural was first painted was narrated by Leonard Nimoy. Wyland said he hopes his friend Jane Seymour will narrate Kearney’s documentary of the restoration. Undeterred by that experience, Wyland has now embarked on creating 100 life-size water sculptures. He plans to donate them to 100 cities around the world. The first sculpture – three leaping dolphins, titled “Faster, higher, stronger,” — was installed during the 2008 Olympics in the Bejing International Sculpture Garden. Asked if he might donate a future sculpture to Redondo, Wyland expressed appreciation for all Redondo has done for him, and said that he hopes so.